...it pulls out into this incredibly high tech (as far as make-up packaging goes) kit. When I first opened it, I wasn't actually sure what to do with it and found it almost overwhelming, but then soon learnt that what you are meant to do is to attach your phone to the purple speaker provided, and pop it into the top by the mirror. 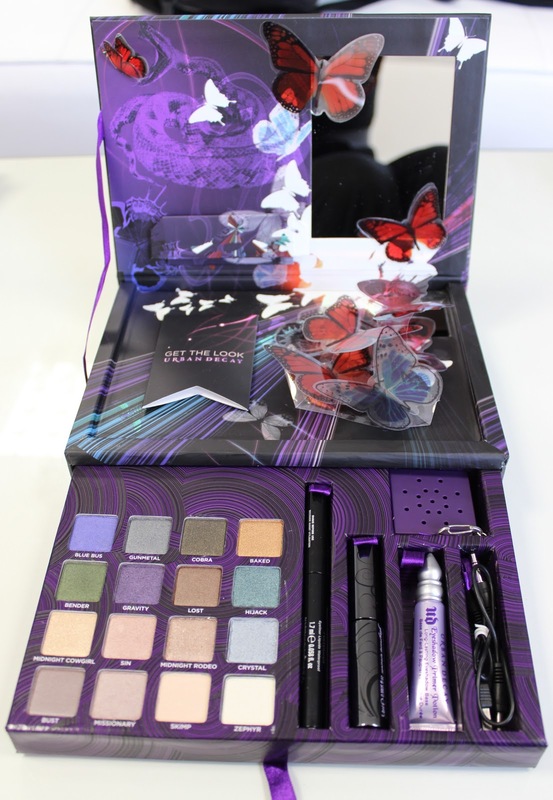 The point of this is because you are also presented with a card that has 5 smart phone barcodes (QR codes) on it which you scan with your phone to reveal a 'get the look' tutorial that you can follow with the products provided, hence the large mirror, which needs to be large because most of it is covered with huge plastic butterflies. I like the idea of this, but not with all the fuss that comes with it. For me, the packaging and all its accessories make the product on the whole a gimmick. Unfortunately I think this deters from the brilliance of the actual products inside, of which time and time again I have praised hugely. I think the products speak for themselves without the need for the full-on packaging and phone accessories. Essentially what they have done is repackaged a selection of their amazing eyeshadows and presented them in a different way - 10 of the eyeshadows are new to the palette, which is a great bonus, whilst the other 6 are staple UD shades. Perhaps something like their NAKED Palette would be more suited to those of you who agree with me on the fussy packaging, it would definitely travel better anyway - with this product it pretty much has to stay on the dressing table, it's big! Granted it is quite a cool concept, and on trend in so far as incorporating smart phones and barcodes into it if that is something that appeals to you, but this doesn't do it for me. However, packing and phones aside I adore the make-up in this box. The eyeshadows are as usual exceptional and faultless with a beautiful and versatile range on offer, a great selection of colours and a few signature UD shadows that I use all the time. The liner is great and simple to use and the forever talked about eyeshadow potion makes a great base for these eyeshadows to work their magic. Ultimately, I love the products inside but don't love the other aspects of this release. I guess as it's limited edition it is fun to do something different and exciting, and even if it is fairly complicated and technical, it definitely has contributed something innovative and new to the make-up world and to the Urban Decay brand. Let me know what you guys think. The Book of Shadows IV is available now for £46. Gorgeous packaging, and i love the last two lines of shadow, theyre stunning. I think the box is too fussy though with the speakers etc, that put me off buying it! They are pretty eyeshadows but I wish UD waited awhile to release this palette. I had picked up the 15 anniversary palette (which I love) and then this came out like a few weeks later.. I was just at the Sephora in Times Square (42nd St.) during my lunch hour & saw these for the 1st time. I'm a big fan of Urban Decay & I'm tempted to get these. I probably will for the holidays, but first I have to buy the Naked palette for my bestie. I truly dislike this kind of packaging. It's not obviously meant for traveling but if I want to bring my eyeshadows along I have to depot everything and put into smaller palette (or buy them separately). Something similar to NAKED palette would be more my kind of thing - sleek, modern, useful and without all unnecessary "gadgets". I think that I would love the shadows and the butterflies. I don't need all of that phone raggle baggle. book and the shadows look amazing. I am from Slovakia and urban decay can not be purchased here, I really have to go abroad :D , because the shipping to SVK is very expensive. wish it had come with instructions, i dont know whether the speaker is rechargeable i think it is because of the usb cable but something to reafrim this would have been nice. i like the fact it comes with "extras" its nice to have more to play with ^_^ but i agree its not nice to carry around . . . i wonder if you could depot the shadows??? Pixiwoos: thank you for talking about this seemingly ridiculous thing. I had not seen it before but it looks GREAT. Hey @Cinderella's Closet, thanks for mentioning that this is available at Sephora Times Sq! I will have to check this out. I don't use any UD products, but have tried some eyeshadow samples and they look great. I love techno-gadgets-the more ridiculous the better-and haven't seen many beauty/techno gadgets that actually make sense. This one appears to make sense. Question: does it charge the phone? or play the ipod? can you set up itunes alarm clock, and make this into a vanity ihome makeup-timer? Wow. On my vanity table i have a clock, phone charger, and mirror-which take up a lot of space. This looks like an all-in-one device. This could be the perfect smartphone-vanity console! Are there other, better products like this out there? Hmm. I plan to check this out and blog about it! But I got my hands on it and have to say the products as usual are amazing. I love this product and use it all the time! Admitidly it would be big to transport around but I brought this from a Groupon promo. I have never used Urban Decay products before but love the eyeshadow. It lasts all day and has a really high pigment of colour so they look as good on your eyes as in the box. It really good value for money with the sixteen shades. I do like the fact that you get the QR codes for the videos to give you ideas and you get a speaker which is great to watch Pixiwoo tutorials when popping on your makeup! Will definately use UD eyeshadows again!